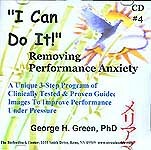 With nearly 30 years of clinical experience in biofeedback, counseling, hypnosis and guided imagery in addition to an amazingly diverse background, Dr. Green's unique guided imagery CD's provide solutions, suggestions and solace in an informative and relaxing format. 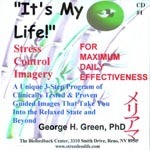 A unique 3-Step program of clinically tested & proven guided images that take you into the relaxed state and beyond. This 3-Step program of guided images takes you beyond the relaxed state into your inner consciousness. Three carefully constructed pain release images to initiate your subconscious pain control mechanism. Improve your performance under all kinds of pressure as well as handle your fear response better. 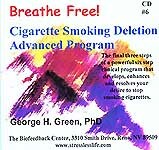 Develop, enhance and strengthen your desire to finally stop smoking cigarettes. 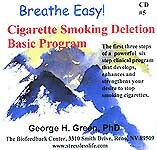 Develop, enhance and resolve your desire to finally stop smoking cigarettes and get your life back. An outstanding collection of special images toward self-empowerment embracing your feminine past with your present self. 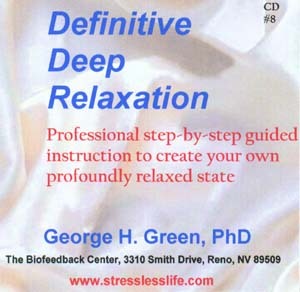 Professional step-by-step guided instruction to create your own profoundly relaxed state. 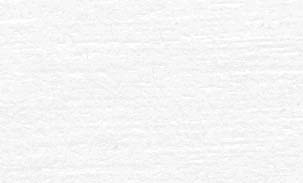 All 23 Powerful Guided Images in Compressed MP3 Format. All 8 CD's in One. Go to Books by Dr. Green.